In 1987, Howard Schultz took over Starbucks, a single location coffee house in Seattle, Washington. Over the next 20 years, in an industry fraught with competition and against all odds, Schultz built Starbucks into a global player: the most recognized and geographically stable coffee house in the world. For several consecutive years in the late 1990s and into the new millennium, Starbucks was opening a new location every single workday. With over 16,000 locations and brand recognition that rivals Nike and Microsoft, you would have to assume there’s something pretty spectacular about their coffee. 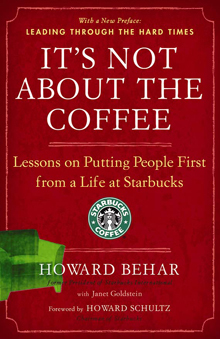 Reading Howard Behar’s (ex-president of Starbucks International), account of his time with the giant, you’d hardly even realize they made coffee. Through the pages of It’s Not About the Coffee, Behar illuminates the fact that coffee has had very little to do with the company’s incredible growth and sustained success over the last 22 years. Certainly quality product is essential to success, but premium beans are not what Starbucks attributes to its success. For the executive staff at the most famous coffee chain on the planet, it’s all about the people. Full of great reminders and key insights into the wild success of the company he once championed, Behar uses It’s Not About the Coffee to remind us that success is really attained through the constant balance of two key factors. The advice is so timeless, in fact, that indications of it can be seen all the way back to the Greek empire. "The Greeks worshipped both Apollo, the god of reason, and Dionysus, the god of the activity of life. The two forces have forever been linked in a paradox: nothing happens unless you do something, yet whatever you do needs to be thoughtfully considered." We need to think carefully about what we do, we need to do it, and then we need to think carefully about what we did. It’s an extremely basic message, yet Behar shares some insights that makes it absolutely worth exploring again, and in some detail. Behar, Schultz and the Starbucks management team believe fervently that in order for an organization to be successful, the individuals it employs need to be successful. And success, as Behar reminds us, comes from being passionately engaged in your work, understanding the reasons for your commitment and dedication, and then taking pride in the outcome. As Behar suggests in It’s Not About the Coffee, and as we’ll discuss in the Insights, there are three stages to personal and professional growth: Challenge, Crisis and Catastrophe. Two out of the three, it turns out, are directly tied to the timeless balancing act of Action and Thought. "We push people to see what really matters to them – not just professionally, but personally. Starbucks isn’t for everybody. No organization is. If you’re not able to work on your dreams, if you’re only working on work, you’re not in the right place." The companies worth working for (truly great companies) have ambitious goals. To succeed in those companies, you’ll need to take on daunting challenges. If your heart’s not in the challenge (because it doesn’t match your own life purpose and ambition), you’re not going to last long with that company. We live in a time of unparalleled opportunity. Gone are the days of giving thirty years to one company and trusting them to provide you with all your life’s desires. That culture has been replaced by one of virtually infinite job descriptions and opportunities and yet, it comes with a catch. Now, more than ever, we need to be in control of our own destinies. No one else is going to manage your career (or your life for that matter) for you. If your daily work, and the challenges it entails doesn’t get you excited – if it doesn’t further your own, personal dreams – it’s time to talk with your boss about finding you a role that does. And if there isn’t a suitable role in your current organization, it’s time to find an organization that is more aligned with your purpose. Look at it this way – if you’re not passionate about your work, there’s a good chance you’ll be leaving soon either way. Better to make the conscious choice than to have it made for you. "A crisis often results when we fail to decide on a direction; a crisis compels us to make the decision to commit to a new direction." I love this quote. It takes the ownership of stress and puts it precisely where it belongs – on us. Stressful situations are the world’s way of forcing us to make a decision. When things are relaxed and running smoothly, the need for us to make directional changes in our lives is low. Why rock the boat? Things are going well as is. But ‘going well’ does not mean we’re working towards our dreams, towards creating our best life possible. We create crisis in our lives when we enjoy the ‘smooth sailing’ for too long. Growth, as we’ve discussed in past summaries, comes only from change. Change comes only from experiencing and tackling ‘newness’ (i.e. challenges). When we get too complacent in the plateaus of life, crisis is the way in which we are forced back on course to pursuing greatness. We get backed into a corner, where the only way out is to change and grow in a new direction. It can be painful, stressful and generally unpleasant. We can dramatically minimize the crisis points in our lives by proactively seeking out change and growth on a regular basis. Certainly enjoy your successes. Absolutely enjoy the view from your newly acquired plateau. Take a time out to reflect on and enjoy the moment. Eventually though, it’s time to start climbing again; start climbing or start sliding down hill. It’s Not About the Coffee is a great insight into the makings of a great company. Interwoven with anecdotes and a personal memoir, the message of It’s Not About the Coffee – that companies exist to further the dreams of compatible individuals, and not the other way around – is clear, poignant and profound. No matter what the industry, no matter what the company, when it becomes more about the product than the people, you’re sunk. There are a lot of great companies out there. Find one that fuels your own dreams, then work your guts out to make it a reality. Si vous avez aimé ce résumé, partagez-le! Super! La séance promet d'être excellente. Il vous suffira de lire le résumé (ce qui ne devrait pas vous prendre plus de 5 minutes) et de participer. Bonne séance!